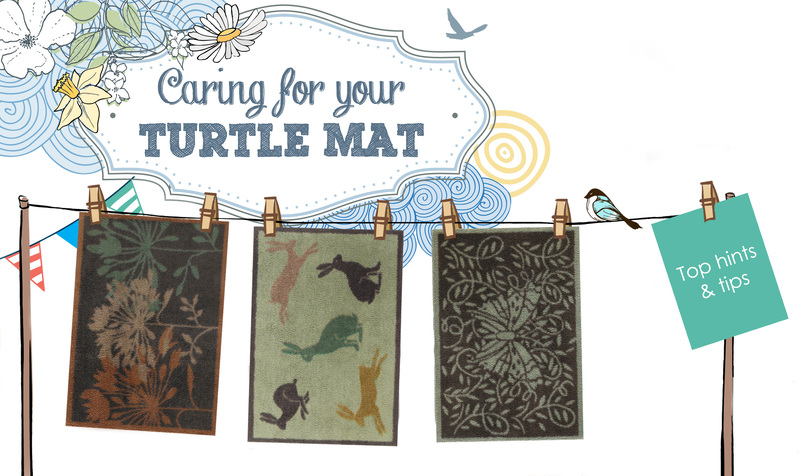 Caring for your Turtle Mat - handy hints and tips - The Turtle Mat Blog - For news, features and competitions! The Turtle Mat Blog – For news, features and competitions! Rebecca Wilson on the subject of Uncategorized. Posted on June 19th, 2014. 1. Lift and launder your Turtle Mats regularly – washing helps to separate and soften the cotton pile ensuring maximum absorbency. Not only that, but lifting your mat helps to prevent a ‘picture frame’ effect on your floor, where it appears as though there is a shadow around the mat from dust settling at its edges. 2. Avoid using fabric conditioner when washing – fabric conditioner diminishes the mat’s dirt trapping capabilities. Turtle Mats love a colour kind detergent without optimal brighteners, such as Turtle Mat Care, which is great value for everyday washing too. 3. Vary how you fold your mat into the washing machine – a gently rolled fold is best to ease your mat into the washing machine and minimise pressure on the folded points; varying where and how you fold for washing also puts less stress on these areas too and will ensure your mat lasts well. 4. After washing, tumble-dry on a low heat setting – to fluff up the pile of your mat so it is ready to stop dirt in its tracks. Alternatively and better for the environment, let your Turtle Mat dry naturally and lift the pile by giving it a quick vacuum or stiff brush once dry. 5. Give your mat a quick refresh – only have 5 minutes until your guests arrive? Give your mat a quick vacuum or brush to get it looking its best and to prepare for any muddy footprints. Let us know if you have any tips for keeping your mat in top shape. Can you vacuum a turtle mat? Hi Helen, thanks for your question. Yes, you can vacuum your Turtle Mat. This is a quick way to give your mat a freshen-up and will also help to lift the pile aiding absorbency. At what temperature and for how long should I machine wash my gray turtlemat? Hi, you can wash your Turtle Mat up to 40C on a standard wash cycle and even tumble dry it on a low heat setting. Hope this helps. Where can I get the cleaning fluid for my turtle mat ? Rather than wash our Turtle Mats in the washing machine, my partner puts them on the driveway and cleans them with the Karcher power washer, then they go over the washing line on a warm sunny day.